LEE COUNTY,Fla. -- The chances of a brush fire sparking near your home has gone up in the last few days in Southwest Florida. The Florida Forest service released a new map showing a high fire danger in Collier and Glades counties. It means fires can start easier and spread quicker in those areas. Other counties in Southwest Florida either have low to moderate fire danger conditions. 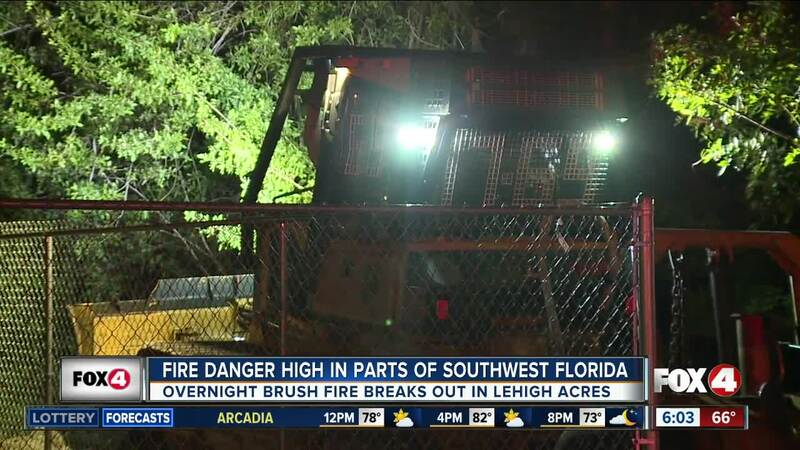 A brush fire sparked near some homes in Lehigh Acres Wednesday morning. The brush fire happened in a heavily wooded area about a mile from Gunnery Road and was less than an acre. Lehigh Acres Fire Rescue contained the fire. Nearby homes were okay, and no one had to be evacuated. - Get rid of any dry or dead debris near your home. - Keep bushes and trees trimmed. - Make sure your fire alarm system works. - Have a plan in place and go over that plan with your family in case there is a fire.